What is it like to face the greatest player of all time? My, oh my, how time flies. It seems like just yesterday that I was battling out on the ATP tour with the best players in the world. I certainly have many, many fond memories of playing pro tennis all over the world. But I can recall one particular event that stands out for no other reason than the fact that I faced arguably the greatest player of all time on the other side of the net, Roger Federer. It may have been a meaningless practice session before a major tournament...or was it? Looking back on that hour, I was struck by his champion-like presence and unstoppable game. Despite its apparent insignificance as a routine practice, that hour playing tennis with him had an impact on me that I will always remember. Let me set the stage. 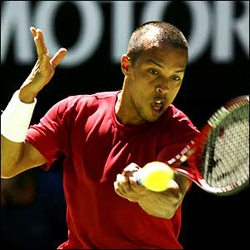 It was July 2004, and I headed up to Toronto to play in the Canadian Open qualifying rounds, one of the top tournaments in the world. Venturing north with me was my coach at that time, Joseph O'Dwyer, one of those unsung gifted mentors, someone absolutely instrumental in helping me break into the top 100 for the first time in my career. With increased skills and new confidence I had dreams. I was two months shy of my 30th birthday at the time and playing the best tennis of my life, thanks to an improved understanding of my own game and upgrades I made to my physical and mental training. Like a fine wine, I felt I was aging quite well and was excited and curious to learn new things on and off the tennis court everyday. With my newly discovered confidence, I had dreams of going deep into the main draw of the Canadian Open. I believed that if I could get through the qualifying rounds, I could make a run. Sadly that was not to be. But little did I know this tournament would be memorable for other reasons other than my uneventful result. I played in the first round of the qualies against an Israeli player, Noam Okun, a career #120-200 world-ranked player. Some might say that a guy like Okun is just a career journeyman. But it just so happens that pro tennis is probably the most competitive sport in which to make a decent living and to be recognized as an elite athlete. I lost in a close two set match on a back court with about 100 fans watching. I didn't play one of my best matches and Okun also played better on the big points. Noam Okun: journeyman or just undercompensated? After the loss I decided that it was better to stay in Toronto and get some solid practice with the main draw players, stay in a 5-star hotel, and eat the great buffet spreads at the tournament. The day after the loss was a Sunday afternoon, and all was quiet on the grounds. I happened to be in the player's locker room with Joseph. It was almost empty with that quiet storm feel before the start of the main draw event. There was only one other player sitting on the other side of the room, his Wilson racquet bag lying on the floor next to him. I looked across the room and saw the one, the only, Roger Federer. Surprisingly, there was no entourage to be found - no coach, no fitness trainer, no physio, no girlfriend - just Roger, his racquet bag, and his unmistakable quiet confidence. 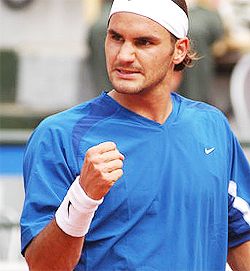 Roger had just won his second Wimbledon, beating Andy Roddick in four tough sets. It was his third grand slam victory and his second Wimbledon. He had taken three weeks off after his most recent triumph and had just flown on his own to Toronto to prepare for this event. 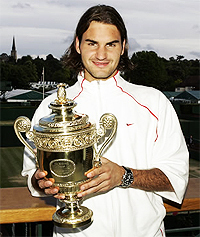 In 2004 Federer had just won his second Wimbledon. As I sat next to Joseph, I realized there were two ways to go. I could play it cool and just walk out of the locker room, or I could actually walk up to a Wimbledon champion and ask him if he would be willing to practice with me. The good news was that I had an angle to get him to say "yes" to a practice session. I had seen the draw and noticed that Federer was playing Hicham Arazi, a talented lefty from Morocco. As a lefty myself, I would be a logical practice partner for him. I walked up to Federer feeling nervous, butterflies in my belly. It felt strangely similar to those five minutes before you walk out onto a packed stadium to play a match on tour. As I got closer to Roger, I could feel his eyes as he looked up at me. I reached out my hand and introduced myself, "Hey Roger-- Jeff Salzenstein, how's it going?" Roger responded, "Oh yeah, Jeff, I know you." I was a bit startled as I had no idea that the famous Roger Federer could know who I was. When you are not one of the "elite" players battling on the big tour every week, you are never really sure which of the top guys know you. 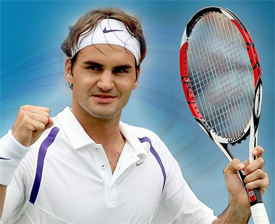 Federer was facing the lefty Hicham Arazi�a perfect opening for me. I thought it was pretty cool that he recognized me and was relieved to find him very personable and approachable. I said to him, "I know you play Arazi first round, and he's a lefty like me. If you would like to practice tomorrow, I'd be happy to help get you ready for your first round match." Without hesitation, Roger said, "Yes, that would be great." The practice time was set for the next afternoon. Needless to say I went to bed that night with a smile on my face. I also was quite aware that I wanted to bring my "A" game and give Fed a solid practice session. The next afternoon I was ready. I strolled out to the practice court about 10 to 15 minutes early. At the time I was in my Pat Rafter zen master stage. For the first time in my life, I had long hair pulled back in a samurai ponytail. I had always had short hair, but at this stage in my career, I decided to grow it out and go with the more rebellious ponytail look. Who was this guy? Was I famous? When I walked out onto the court, the tennis fans that had gathered around were looking at me. I could see them thinking, "Who is this guy? Maybe he is famous, but I don't recognize him." The ponytail was making them wonder, but they probably wished that I was Rafter or Nalbandian. Somehow these fans knew Roger was preparing to practice on this particular back court. The buzz was apparent as they stood outside the court with pens, paper, and big yellow tennis balls in place. Without bleachers to support the crowd, it was feeling more and more like a mob scene. They were eager for King Fed's arrival. Then Roger strolled out with his racquet bag slung over his back, a strap over each shoulder�again no coach, no physio, and no girlfriend. Despite his status, there was an unassuming quality about him. You did not get the feeling he was interested in attracting attention to himself like other superstars. Roger found his way through the maze of tennis fans, opened the small gate to the practice court, dropped his racquet bag down, and we exchanged "hellos." The King had unmistakable presence. I distinctly remember the sound of the fresh balls leaving the cans and Roger Federer bouncing one off the court with his racquet as we walked back to the baseline to prepare to hit the first groundstroke. The whole thing was surreaI. I felt like pinching myself. I was officially hitting with the King of Tennis. Despite being an accomplished player, I was very nervous to play with Federer. I knew it was just practice, and that it didn't mean a lot in the vast scheme of life. But it meant a lot to me, because at a few months shy of my 30th birthday, I didn't know how much longer I was going to play professional tennis. Now, here I was knocking the ball back and forth with the newly crowned Wimbledon champ. I remember in the first ten minutes of the practice I continued to feel that champion-like aura. It was everything from the way he carried himself to the way he performed routine tasks like picking a ball up off the ground. You could feel his aura from 78 feet away. 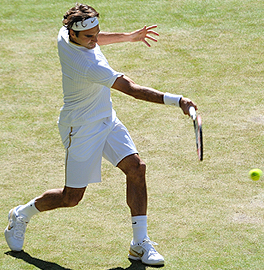 Federer's movement: graceful, relaxed, deceiving. Not to mention the way he hit the ball. Roger's ball popped off of his strings--what a sweet sound the ball made off of his racket. It sounded different than the way I hit the ball. And his movement! Well, we all know about his movement, so precise, relaxed, graceful, and elegant. And so deceptively fast. I was completely intent on doing my best to give Roger a great workout. The practice had nothing to do with me and everything to do with giving Fed a great workout. I was just hoping I could keep the ball down the middle of the court and put it right on his strings so that he didn't have to move too far off the middle in the warm up. After 15 minutes and a short water break in the muggy summer conditions, we started a practice set. My sense was that Roger was probably in 1st or maybe 2nd gear. I knew instinctively it was nothing like the 5th gear ridiculousness I'd seen in the Slam finals, pulling off shots from every conceivable angle. Still there were flashes of brilliance. The crowd let us know with their "ooooohs" and "aaaahhs" after certain points. I was struck by the weight of Roger's serve. Even in a lower gear, I could feel the impressive aspects of Roger's game. I noticed immediately how heavy his serve was and how well he located his spots. His serve was not quite as heavy as Pete Sampras' serve with whom I had practiced with a few times before. However, the ball still exploded powerfully off the high bouncing hard court, often times into areas of the service box where I could barely get a racket on the ball. I also noticed how Roger attacked the ball with his feet. In fact, anytime that I hit even slightly short or Federer put me into a defensive position, he had his nose on the net. I could not get over how quickly Roger was able to get from the baseline to the net. His catlike quickness was smooth, powerful, and intimidating to play against. I had never experienced anything like it before. Against other professional players, I usually had time to put the ball down at the feet when they got to net. I never felt that with Roger. He exploded from the baseline and covered the net like a blanket. At one point, I attempted a lob. Federer got up in the air so quickly and explosively, it was like Kobe Bryant. He obliterated the overhead and let me know that I should never consider lobbing him again. Federer sent a signal when e obliterated an overhead. Everyone talks about Federer's forehand, his deceptively accurate serve, his graceful movement, his ability to go from offense to defense in the blink of an eye, and his ability to handle just about any shot from any position in the court. That was a lot to fear, but there was another shot that that was downright nasty to deal with. Can you guess which shot blew me away? It was his short backhand crosscourt slice, hit on a 2nd serve return. Normally, I loved playing righties with a one handed backhand. I could pick on the backhand with my own heavy forehand. But Roger put me on the defensive from the get-go with the short backhand crosscourt slice. Roger's short crosscourt slice put me on the defensive. I spun my lefty serve into the box to his backhand on the ad side, and Fed took the shoulder high ball and knifed it cross court with a textbook modern slice. This shot was just crazy good. It stayed incredibly low. It seemed like it bounced 2 inches off the ground and had surprising speed. The short angle meant the ball also veered off the singles sideline between the baseline and the service line. By the time I hit this shot with my forehand, I had been pulled inside the court and out into the alley--not a fun position to be in after a second serve. The ball was not short enough to come to the net but short enough to keep me from recovering behind the baseline. Imagine being in no man's land AND outside the singles court! It was a losing proposition. I could almost feel Federer chuckling to himself as I struck the ball, because Roger had me beat before I hit that first shot after my serve. If I went back cross court, Roger could rip or slice his backhand down the line. Or he could run around his backhand and crush a forehand "inside out" behind me. Or he could go "inside in" to the open court. The inside in forehand: only option to hurt you. If I chose to hit down the line with my forehand, I had to get the ball up and down quickly and hit an outright winner. Even if I hit a screamer down the line, Federer's athleticism would allow him to get to the ball and hit a running forehand cross court. The moral of the story--I was in big trouble regardless of what choice I made. So I tried various poisons throughout the set--sometimes down the line, sometimes crosscourt. Neither strategy worked. I was left thinking to myself--Federer's backhand was supposedly his weaker wing, but I could not beat him with my strength to that side. Clearly, this was all an indication why I am now coaching tennis and Federer is still winning Grand Slams. Overall, the mismatch was pretty clear. I felt like I could hang with Federer to a certain degree, but at the same time, I felt helpless against his arsenal. Because of his athleticism, ability to move the ball around, incredible slice backhand, explosive serve, total composure and so much more, I lost the set 6-2. A deadly arsenal that combines athleticism and sheer explosion. Bottom line--I didn't play great, but probably because Federer forced me to play below average. And there was no doubt the nerves inside me kept me from really getting into the flow of the set. I desperately wanted to put up a better fight, but on this day it was very difficult playing the best player of all time. So what did I take away from my on court practice experience with the great champion, Roger Federer? Roger was a totally cool dude, very approachable and didn't give off the appearance that he was full of himself. Roger appeared very comfortable in his own skin. He actually had a humble demeanor as he walked out on the court to play with me. Federer has an undeniable presence that lures people to him. Roger has rock star charisma, but at the same time he could also be easily mistaken for a good friend and college buddy. If you hit with him you realize Roger is even better than you imagine. Roger plays the game unlike any player before him, and there might never be another player that exudes his grace and ease. This effortlessness combined with his sheer explosiveness was an amazing combination. Federer had no trouble putting me in very uncomfortable positions on the court, and I could only imagine how it would feel playing him in front of a sold-out crowd in a place that he owns like his Wimbledon Centre Court home. Roger used first and second gear to dominate me. Fifth gear must be pretty darn sweet. Even in our "light" practice together, Roger was driven to succeed. Our session lacked match-like intensity, but I could feel his drive, determination, and even a hint of anger when he made "routine" mistakes. He owned that balance of being calm, cool, and collected while exhibiting unmistakable passion and feistiness. Dumb mistakes were not an option for him. I could tell Roger's run at the top was just starting. After winning his third grand slam, it was clear to me that his run was just at the beginning. You could feel an unmistakable purpose behind his approach to the game. I knew there were many more Grand Slam titles in store for him. In the end, the 2004 Canadian Open was one of my fondest memories despite my poor result losing in the first round of qualifying. I was able to experience one of my greatest moments as a professional tennis player. I was grateful that I had the chance to practice with Roger Federer even if it was for one hour on a back court in Toronto. Feeling him on the other side of the net was a dream come true. Everything you see on TV or live in person when you watch Roger play is real. He is remarkable, one of a kind, even better than you think. Jeff Salzenstein is the founder of JS Performance, dedicated to helping tennis players of all levels achieve optimal performance on and off the tennis court. Jeff was a national junior tennis champion and a two time All-American at Stanford where he played on a NCAA collegiate championship team. 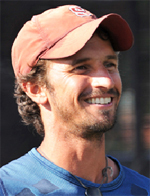 A former ATP Top 100 Touring Professional in singles and doubles, he is a USTA Certified High Performance Coach, and Nutritional Therapy Practitioner, based in Denver, Colorado. Click Here to visit Jeff now! 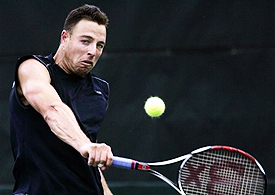 Click Here to check out his forehand instruction video, The Forehand Solution!